Placed on the shores of the Lake Babadag, the town of Babadag (a Turkish name meaning "Father's Mountain") spreads along the hills and valleys of Sultantepe, Coiun-Baba and Carada. A little to the North-East of the town there is an archaeological site, endangered by the growing levels of the lake, with findings from the Hallstatt and Late Roman (4th - 7th century) periods, kept in the present at the History and Archaeology Museum in Tulcea and in de deposits of the Thracology Department at "Vasile Pârvan" Institute of Archaeology. The Babadag Culture was named so by the romanian archaeologist Sebastian Morintz after the findings from the late 20th century. The history of today's town begins in the 13th century, along with the Ottoman occupation. 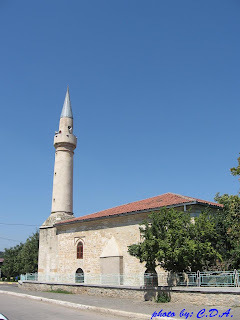 The main attractions are the 17th century Ali-Gazi Pasha Mosque (with General Ali-Gazi Pasha's tomb), one of the oldest Muslim monuments in Romania, the medieval tower and the "Yemeklik cesmesi" fountain, built in the middle of the 18th century, the last of the town's medieval monuments. One can also visit in Babadag the "Panaghia House" (Maiden's House) which nowadays hosts a collection of oriental art from 17th-19th century and . Some info about the town can be found on Wikipedia. A nice timeline (in romanian) and a photo gallery (with this I know they could have done better) are present on the local administration's website. The satellite view is, as always, from Google.